That’s according to a Jan. 10 “sidebar” memo from legal specialists at the Congressional Research Service, who freshened their past analysis of the president’s statutory emergency powers. The memo, made public by Steven Aftergood in his blog for the Federation of American Scientists, suggests that the Pentagon might rely on the Supreme Court’s 1984 ruling in the Chevron case—which ruled for deference to agency experts on complex regulatory matters—to be final interpreter of whether a border wall is part of the department’s mission. Congress’s research arm updated its past survey of relevant statutes, beginning with the 1976 National Emergencies Act, and moving to a 1982 update known as Section 2808 addressing military construction authority. The issues the courts would consider would begin with a “dispute about whether conditions at the border provide a sufficient factual basis” to invoke the updated emergency authority. And “the president must determine that the relevant construction project (i.e., border fencing) would address a problem qualifying as a national emergency,” CRS said. 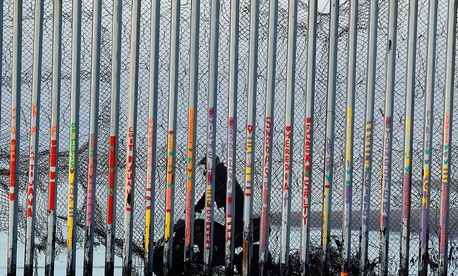 “If the court were to conclude that the situation at the border qualifies as a national emergency that requires use of the armed forces and the construction of a border wall is necessary,” the research service continued, “it would then need to assess whether construction of a border wall qualifies as a “military construction project’ “ within the statutory meaning. Legal challengers, however, be they individuals or local governments, would have to establish standing as having a personal stake in the controversy, CRS wrote.